New York Rangers President and General Manager Glen Sather announced today that the club has acquired forwards Derick Brassard and Derek Dorsett, defenseman John Moore, and a sixth round pick in the 2014 NHL Entry Draft from Columbus in exchange for forward Marian Gaborik, and defensemen Steven Delisle and Blake Parlett. Derick Brassard was the No. 6 overall pick by Columbus in Round 1 of the 2009 NHL Entry Draft. Brassard, 25, has registered seven goals and 11 assists for 18 points, along with 16 penalty minutes in 34 games this season. He currently ranks third on Columbus in points, is tied for second in assists and fourth in goals. He also leads the team with six power play assists, and is tied for the team lead with seven power play points. Brassard tallied an assist while skating in his 300th career NHL game on March 12 against Vancouver. The 6-1, 205-pounder has skated in 309 career regular season contests over six seasons with Columbus, registering 58 goals and 111 assists for 169 points, along with 184 penalty minutes. He established career-highs in goals (17), assists (30), points (47), penalty minutes (55), power play goals (six), power play points (16), and shots on goal (183) during the 2010-11 season. Brassard made his NHL debut on January 11, 2008, against St. Louis, and recorded his first career point with an assist on January 20, 2008, at Columbus. The Hull, Quebec native was originally selected by Columbus as a first round choice, sixth overall, in the 2006 NHL Entry Draft. Forward Derek Dorsett, an alternate captain in Columbus, has a combination of toughness and skill and had a Gordie Howe Hat Trick earlier this year. Dorsett, 26, has registered three goals and six assists for nine points, along with 53 penalty minutes in 24 games this season. He has missed the last 12 games with a broken clavicle suffered on March 7 against Vancouver. Dorsett currently ranks second on Columbus in penalty minutes (53) and fighting majors (five), and is tied for fourth in hits (55). He posted his first career Gordie Howe Hat Trick with a goal, assist and fighting major on February 21 at Detroit. The 6-0, 195-pounder has skated in 280 career regular season contests over five seasons with Columbus, registering 27 goals and 38 assists for 65 points, along with 727 penalty minutes. Last season, he established career-highs in games played (77), goals (12), points (20), penalty minutes (235), hits (199), power play goals (two), power play points (three), and shots on goal (137). Dorsett made his NHL debut on October 11, 2008, at Phoenix, and registered his first career point with a goal on October 21, 2008, against Vancouver. The Kindersley, Saskatchewan native was originally selected by Columbus as a seventh round choice, 189th overall, in the 2006 NHL Entry Draft. Defenseman John Moore was the No. 21 overall pick by Columbus in Round 1 of the 2009 NHL draft. Moore, 22, has registered two goals and six assists for eight points, along with 10 penalty minutes in 86 career regular season games with Columbus. He has tallied one assist in 17 games this season. The 6-3, 205-pounder established career-highs in games played (67), goals (two), assists (five), points (seven), hits (47), blocked shots (70), and shots on goal (64) as a rookie last season. Moore made his NHL debut on February 5, 2011, against Edmonton, and recorded his first career point with a goal on October 25, 2011, against Detroit. The Winnetka, Illinois native was originally selected by Columbus as a first round choice, 21st overall, in the 2009 NHL Entry Draft. Gaborik, 31, has registered nine goals and 10 assists for 19 points, along with eight penalty minutes in 35 games this season. He signed with the Rangers as a free agent on July 1, 2009. Delisle, 22, has split the season between the Connecticut Whale on the American Hockey League (AHL) and the Greenville Road Warriors of the ECHL. He has tallied two assists in four games with Connecticut this season. In Greenville, Delisle has recorded four goals and 16 assists for 20 points, along with 85 penalty minutes and a plus-23 rating in 61 games. He was acquired by the Rangers from Columbus, along with Rick Nash, in exchange for Brandon Dubinsky, Artem Anisimov, Tim Erixon, and a first round pick in the 2013 NHL Entry Draft on July 23, 2012. Parlett, 23, has registered six goals and 22 assists for 28 points, along with 85 penalty minutes in 67 games with the Connecticut Whale (AHL) this season. 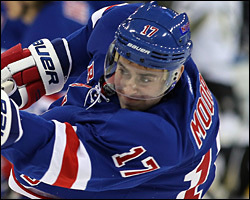 He signed with the Rangers as an undrafted free agent on June 2, 2011.